ETA Theater, Chicago, May 4, 2010. Thank you for inviting me to take part in this memorial. It is one of my life’s great honors. And thank you for letting me speak early so I can return to teach a class that meets this evening. My name is Richard Guzman. I’m a writer, and performer, and I teach at North Central College. In a way, I realize that my view of Carolyn may be way off from the view many of you have, who have known her much longer; but I hope my view is valuable nonetheless. I first met Carolyn Rodgers a dozen years ago when I was working on an anthology of Chicago writing called Smokestacks and Skyscrapers. It was the first really comprehensive collection of Chicago writing, and I knew immediately that she belonged among the greats like Carl Sandburg, and Saul Bellow, and Nelson Algren, and Gwendolyn Brooks, and Lorraine Hansberry, and Haki Madhubuti. That’s the company I thought she deserved to keep. Then about a half-dozen years ago I worked on another Chicago anthology, Black Writing from Chicago: In the World Not of It? Carolyn not only consented to be in this collection, she also favored me with a wonderful, gracious Foreword, in which she said: “This is an extraordinary book…a scholarly book of great importance, and a sheer delight to read as well.” For this alone, how could I not be in her debt forever? Yet I always felt this activism and outwardness was never her real métier. This made me admire what she had done even more. In my own way, I have also spent a lifetime in activist concerns, yet I felt in Carolyn what I have always felt in myself: the urge to get out of the action, to draw away to some quieter, more inward place. This sense of limits is invaluable for anyone trying to change the world, or even just trying to help one person along. In his Pulitzer Prize-winning book Elbow Room, James Alan McPherson, who owes a lot of his literary success to the South Side, describes the face of one of his characters whose soul is definitely “blue like berry stained.” His words always remind me of Carolyn Rodgers’ face. McPherson says, “It is a free face, a fresh face. In it I can see no servitude to the expressions of faces I have seen before. Hers is a smile completely unaware of any predecessor. It derives entirely from within itself. Her mystery, I think, is an awareness of this liberation from the familiar.” McPherson calls that inward place a person’s “secret self” and is obsessed with the importance of nourishing and protecting and deflecting attention away from it in order not to be co-opted by “normal” reality. Carolyn Rodgers’ smile radiated from her “secret self,” from a place completely within, an inward space we need to understand as desperately today as ever. Like most great poems, this one refers to many things at once. 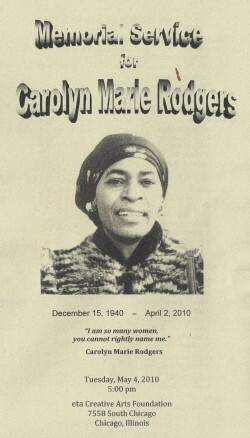 These days I’m finding that Carolyn’s words refer to finding yourself deep within. Her life and writing gave us clues and encouragements for finding a deep, inward place, a place especially important for those who would do battle with the outward world. For only in a place so deeply inward can we guard our “secret self,” a sense of our personal essence, an essence which also keeps us connected to powers much higher than the world. The world is therefore anxious to crush or steal away that essence, for doing so is the only sure way to defeat us. A dozen years ago in something I wrote about Carolyn, I quoted words from her poem “how i got ovah II / It Is Deep II.” I said she strove to, “understand the mysteries / of the mystical life, the ‘intellectual purity’ / of mystical light.” I wrote that her later writing expressed “a sense that the outer, sometimes revolutionary concerns of her earlier poems must be joined to a deeper sense of how some of the things we used to flee” – like family, like religion, like quietness – “can become resources for an inner life, strong and resilient enough to meet the demands of an outer revolution we never suspected would take so long.” In a world of intractability and often soul-crushing struggles, Carolyn’s words gave us not only reasons to continue, but clues on how not to lose yourself, so you could find yourself instead, every day, until you found yourself in a better world. ♦ There are several other pieces on or by Carolyn Rodgers on this site. Go HERE for a post which lists them. This entry was posted in Black Writers, Chicago Writing, Poetry, Social Change and tagged Activism, Black Writers, Carolyn Rodgers, Elbow Room, How i got ovah, James Alan McPherson, Leadership for Social Change, Prodigal Objects, Richard R. Guzman, Social Change. Bookmark the permalink.